The way I write is like an avalanche. Presently, I have four novels in the process. Two of which, in my excitement, were sent to agents in the hope of getting them published. After many rejections, I pondered what I could do to improve my stories. Not having access to a ready stream of editors and draft reading guinea pigs, left me in a quandary. Online, there are myriad resources for writers and between several different suggestions, I created my own scene outline and plot guide. This has helped me a great deal in figuring out various sections and explanations of the chapters. Some of the ways it aided in clarification and how you can use the template, are outlined below. The parts explain where you are in the story. If you follow the timeless adage of a beginning, middle and an end, you can simply add beginning in the first column. If however you are writing something epic and are not following any one system, the possibilities are endless. You could, for example, add Season one or a certain character reverie as the part. I prefer to keep it simple, as my writing is chaotic and structure is something I have to work hard on. For me, I add beginning and draw lines down with arrows to where the next part begins. You can use the word program for this or if you’re like me and like to print, you can easily draw it on by hand. The parts are directly related to the timeline and must be considered to ensure pacing is kept at a reasonable level and the reader doesn’t get too bored. Along with the timeline, seasons help the writer pen down the parts of a novel in such a way that they can follow along and easily grasp where they are in the book. The timeline can be depicted in seasons, dates months, years and by character development, namely age. Cross-referencing the character list with a column dedicated to age and timelines is so very helpful when organizing the structure of a novel. If you are like me, and write like a maniac, the words spilling on the page as if you’re in a trance, forgetting to eat and writing parts of your novels via self-addressed emails, on your way to your day job, figuring out structure is the catalyst in forming an easy to follow novel. Winter is my favorite Season and I often find that through my writing, it is perpetually Winter! There’s something about the snow and the bleak landscape that I have fallen in love with. It has taken a lot of discipline, combined with a very detailed scene outline and plot guide to persuade myself to include Summer. There’s a great deal to learn about writing descriptions of the so-called warm season. I’m distastefully pushing my boundaries with that one. This one seems a little obvious, but it is super important. Without the Chapter column, the other sections would not make sense. It can be labeled, romantic interlude, noting the characters involved, or introduction of, such and such a character. The chapters tie everything together and make it easy for you to move things around if you feel one chapter might better be placed before another. It could be that there’s a chapter describing a past event where the reader would gain a benefit in knowing the history, prior to delving into the character plot of a given scene. A while back, I asked on a writers forum, for a critique of the first few chapters of my favorite novel so far. The feedback was valuable and the gentleman suggested I split up the first chapter and add the past tense paragraphs to the beginning. This, he suggested, would help with the flow and encourage the reader to continue. He also suggested I shorten my sentences. Sound advice, although sometimes difficult to master. Chapters delineate sections in a novel. The original idea for the novel can be broken up into its parts by organizing it into well-defined chapters. Splitting up whole sections into chapters has helped me to define plot points and expand on the original idea of the section. Sometimes, the separated chapters, lead me to new ideas and help to elaborate a scene into a monumental turning point in the book. Like I said, I write like a maniac, the words spilling onto the page. The trick to good writing is defining the verbal noise from the gems that sparkle, setting the readers emotions into a flurry. Defining chapters help with this a great deal. Example of a map I’m working on in illustrator. I prefer my tattered old version, drawn on lined paper, but I can’t give my whole story away! So you get to see the ‘fancy’ digital version that’s not yet finished. Cartography is a passion of mine and being a visual person, I create my own hand-drawn maps, occasionally creating a version in Adobe Illustrator, when time permits. The maps I draw, sit next to me at all times and I scribble down notes on them. 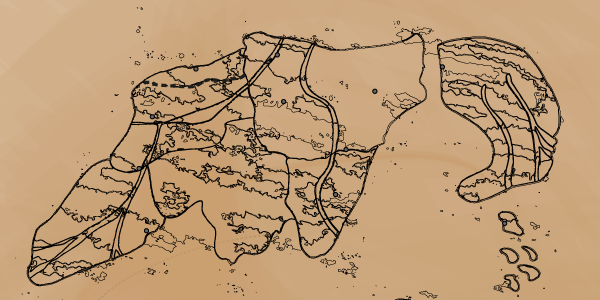 I plot the paths the characters travel on with thin dotted lines, outline borders, forests, and cities. Occasionally I’ll add notes to major events that have happened in a specific region. This is then added to the scene outline and plot guide. Maybe it’s overkill, but my writing style requires great discipline when it comes to structure. The characters become a part of me and that affection can lead to editorial errors. Not to mention, chaotic and jumpy scene shifts. Outlining the region helps greatly with determining the weather and Seasonal changes throughout the novel. Especially if the world you have created, is not a mirror of the one we inhabit. Noting down the reaction to a scene helps with writing flow and ties parts of the novel together. This column has been instrumental in making sure sections of my novels are followed by the cause and effect rule. The Queen kills the King. Later we find out the consequences of her actions. She can’t just kill the King! The reaction to a scene is also called a sequel. I find that confusing, but it should be noted, in case you’re used to that term. In this column, you can note down simple phrases like the Queen finds out the King was holding back an army of zombies when he was killed, the zombies moved towards her kingdom. Adding the chapter where the reaction takes place is also a good idea, for future reference. This is my favorite part of writing. Determining the characters, their attributes, names and cultural sensibilities is pure bliss. I have pages scattered around my home, with lists, descriptions, possible cultural persuasions and ideas of how the characters intertwine with each other. The character column, helps me keep track of everybody’s movements and makes sure, a character doesn’t show up in a city, when he is actually on the other side of the world. Unless of course, he has magical power’s, but that’s beside the point. Defining which characters are in a particular scene, help elaborate on the plot events and add structure to their locations and where they will end up. The introduction of characters is equally important. This might seem a bit over the top, but for me, it helps with the continuation of the plot. It allows me to define where a new character is coming into play and if it is adding one too many characters in a certain part of the book. I have a novel that’s six hundred pages, that I’m working on. Keeping track of the new characters is mind-boggling, to say the least. Although I must admit, the aforementioned novel is my baby. Editing it turns into reading it. Sections are cut out and moved to other novels, characters names have been changed, new worlds created, children were born and then those sections were removed. The list is endless. The point I’m at now, with this particular novel, is back to the original draft. Now, I need to remove the sections I stole from this novel and write a new section, around twenty chapters of another novel I’m working on. The life of a writer! Characters can be introduced when the setting changes and is defined. Differing from the timeline and Season, the setting adds the descriptive language, backing up the scene and giving the reader a bird’s eye view of the situation. It might be Winter, but are they in the mountains? Or are they sweating in a swamp infested with crocodiles? Describing cities is a great way to reel the reader in. The setting can denote a romantic, dreamy city, or a harsh and bitter town on the outskirts of a coal mine. This column in the scene outline and plot guide, ties in with the timeline, season and region, assisting with the major events and major plots, further along in the template. The setting is one where I need to watch my sentence length. The flow of descriptive words falls like a hailstorm onto the page, hammering out any other finer points. Well, for me at least. I’m often more interested in the social interaction of the character’s and dialogue, forgetting to set the scene properly. This is something I’m working on. But I don’t like it. One must be careful to balance the setting with the character interactions. Explaining the rolling hills of Ireland over the course of three pages could be detrimental to the timeline and bore the reader. I myself, don’t have to worry about overdoing it in this area. Landscape description needs to descriptive enough for the reader to gain an exacting picture of the scene in their minds. Being careful not to over describe the scene setting, so the reader does not lose interest. There are many ways to add detail to setting descriptions. One can easily write, they were surrounded by the desert. But what kind of desert? Is it a cold and windy Siberian desert? Or does the harsh winds of Arabia, lash hot sand across the dunes. Blinding the inhabitants and rendering them speechless? Is it a swamp? Or a mirror of the earth we live on? Seasons also play a huge role in story writing and can instantly imbue a description of a landscape with only a few words. Here, we get to the nitty-gritty of structural integrity. The scene might introduce a character and their history, but the events are the actions, signifying a turning point in the novel. The scene could read, the Queen kills the King and the Major Event in relation to that scene, could be and the Queen burnt the city to the ground. I will admit, I need to work on the events. Defining them and elaborating on their significance and the relationships between the reaction to the scene. Often, I add too many events in one paragraph and it spirals out of control. This column helps me a great deal with structuring and pacing my writing. The scene and the major events lead us into the major plot. The Queen is introduced, she kills the King, zombies invade as the reaction and she burns the city down. The major plot description is the reasoning behind the Queens actions. The Why. That leads into what happens next. In my writing, I have way too many major plots. The excitement of writing battle scenes gets smashed together with romantic twists that are all out of sync. I’m working on that! It’s not as much fun and editing can be tiresome or can be overlooked, by the excitement of the scene and me saying to myself, but it’s too good and intense to split up! That’s when I put the novel away until I can be the mean editor, but not too mean, otherwise I end up cutting whole chapters in my haste. You have to find the writing editing balance. This guide is really helping me with editing and defining the major plots. It takes time, but it’s relaxing, setting up the grids and feeling like you’re contributing to the publishing effort. Keeping things in simple sentences helps to define the novel and relay any conflicts that are happening in the book. Conflicts are important in a sense of the major plot and the scene. The conflict would be the zombies coming for the Queen’s kingdom after she killed the King. The conflict happens at the same time as the major plot and scene. The conflict column helps to define what else is happening in the chapter and whether I should move a conflict section into another chapter. Sometimes, the conflicts can be built upon and can become a reaction to a scene. The template makes it easy to move sections around with a simple cut and paste. Personally, I like to print it out, then I scribble all over it. I’m trying to keep to the neat word version, but old habits die hard. There’s something about print that helps me to concentrate. Must be the physical touch of the paper. Conflicts can lead to consequences of earlier events and having them side by side, makes it easy to cross-reference them with the reaction to a scene. The consequences of earlier events are different to a reaction to a scene, in the sense that they can outline alternate event outcomes. Reaction and consequence in this situation are different. The reaction would be when the Queen killed the King and the zombies were let loose. The consequence would be what led the Queen to kill the Queen in the first place. I have to push myself with this column. Grit my teeth as I inwardly say no, no, no, no, I don’t want to do it! Printing out the drafts helps me a great deal, as I can jot down notes, defining the structure and the chapter relationships. My mind reels on this part. I often wish I had a husband who was secretly an editing fanatic, without the harsh rebukes. The Notes column is self-explanatory. In this column, I often jot down ideas and possible relationship action points. Sometimes, I’ll write, add a new chapter about such and such or define the chapter in relation to scene outline and consequences. I hope the template I created, helps you with achieving that golden word, published. If you’d like me to review your work or need help with editing and defining plot, drop me a mail! If you have questions about the template, you’re welcome to get in contact.